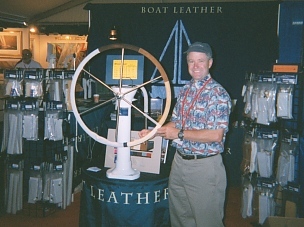 For years, riggers have protected sails and lines with leather. We continue that tradition with leather marine products that have been tested by thousands of sailors from around the world. We are a small company run by experienced boaters. We design our products to fit properly, function well and withstand the harsh marine environment. Our products are 100 percent guaranteed! And we offer fast worldwide service and delivery. Come see us at these upcoming Boat Shows!